Bonjour! This week it was French week in GBBO, Sue and Mel put on some funny French accents, and we saw lots of snails rather than the usual rabbits and squirrels at the Harptree Court location. This week it was also the semi-final of the show, which meant the pressure was high. The first challenge was to make petit fours. These are desserts usually served at the end of a meal, and are always small and dainty. 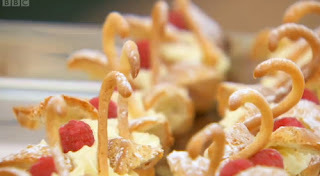 It’s safe to say that Brendan’s fabulous choux pastry swans stood out here (pictured above). They are gorgeous, and he executed them perfectly. This guy never breaks a sweat or looks panicked at all during baking. When everyone else is running around, he is calm and collected. A baking robot if ever I saw one! Brendan also made coffee macarons with hazlenut cream (pictured below). 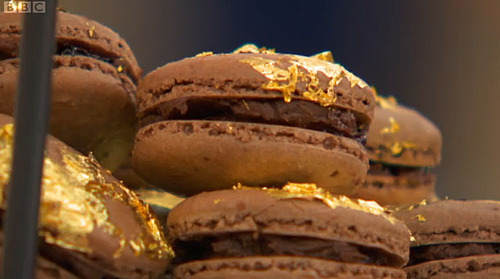 Macarons were a popular choice for the bakers, with James and John also making them. James experimented with chili in his macarons, he is always pushing boundaries, but the judges enjoyed it. 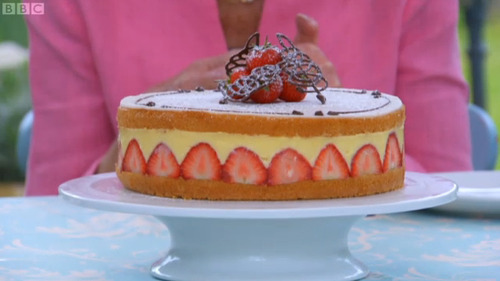 The technical challenge this week was Mary Berry’s Fraiser cake. This is a Genoese sponge, which is a highly voluminous sponge. It’s cut in half with a thick crème patisserie and some strawberries arranged in the middle. Finally a layer of marzipan on top and chocolate piped on in various ways to decorate. 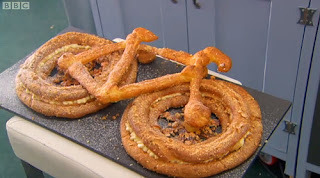 This looked really tough, the sponge looked very tricky to get right, and getting the crème patisserie thick enough to support the top layer of the cake proved too tough for a couple of the bakers. Danny’s Fraiser collapsed which was really unfortunate. 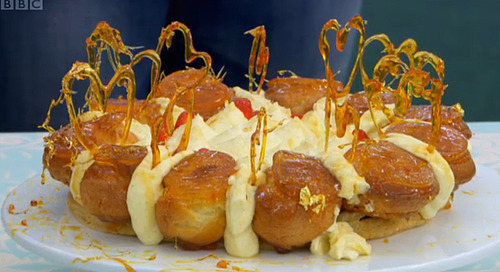 For the showstoppers this week the bakers made Gateau St Honore Cakes using choux pastry, filled with cream and flavoured with fruits. John’s cake was a bit messy, but I loved the caramel hearts he decorated it with. James made an epic bicycle shaped cake which as usual went down very well with the judges. This week I decided to give macarons a go. I would like to make choux pastry at some point in the future, it is defnitely on my baking list. The Fraiser cake I will definitely be avoiding! I started by lining two baking trays with sheets of baking paper. I wanted my macarons small, petit four style, so I used the cap off a bottle to draw 3cm circles onto the paper. In a bowl I mixed 100g icing sugar with 75g ground almonds. I used a hand blender to make sure they mixed together well and became smooth and fine. In a separate bowl I whisked the whites of two eggs with an electric whisker. Once they form stiff peaks, add 75g sugar bit by bit, whisking between each addition. The recipe said to use granulated sugar, but I used caster and it was fine. Then add pink food colouring and whisk in. I only added a few drops, but I would recommend adding more as mine weren’t very pink after baking. I must confess that I got so absorbed in getting the mixture right I only snapped the below photo. I folded the icing sugar and ground almonds into the meringue mixture bit by bit. Mixing only until just combined. Do not over mix if you try this. I transferred the mixture to a piping bag with a small plain circular nozzle. Holding the bag vertically, I piped the mixture into the circles on the baking paper. I baked them on 150C/200F/Gas Mark 2 for 5-10 minutes. They are only small so didn’t need long. The tops are firm once baked. I left them on the paper for 15 minutes, then transferred to a cooling rack. If you moved them too quickly they can break. Treat them gently as they are very delicate. To make the topping I whisked together 150g mascarpone and 50g seedless raspberry conserve. The only seedless raspberry conserve I could find in the shops was this one pictured below. Once the meringues were fully cooled I used a knife to smooth the filling onto the underside of one, you can also use a piping bag to pipe the mixture on, but if you’re very gentle a knife works fine too. Place another meringue on top to create a sandwich and the macaron is ready! Some recipes said to eat of the same day, others said to wait till the next day to eat. I say dig in! Enjoy these little sweet treats straight away, they are hard work to make after all and I definitely needed a reward for my efforts. Macarons can be made in many different ways, all following the same basic recipe just adding different flavours and colours. You can put cream in the middle, ganache or fresh fruit. wow a great result. I am still trying to crack the macaron making process. Sometimes a good result sometimes dreadful!